Since its launch the Sony α9 has been said to capture action at ludicrous speed, making it a great camera for sports photography. 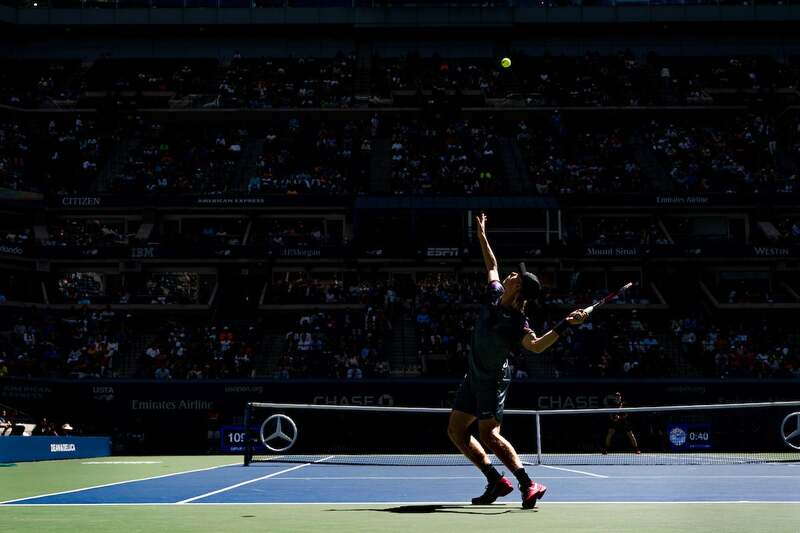 The quick and intense nature of tennis at the U.S. Open made it the perfect environment for the α9. 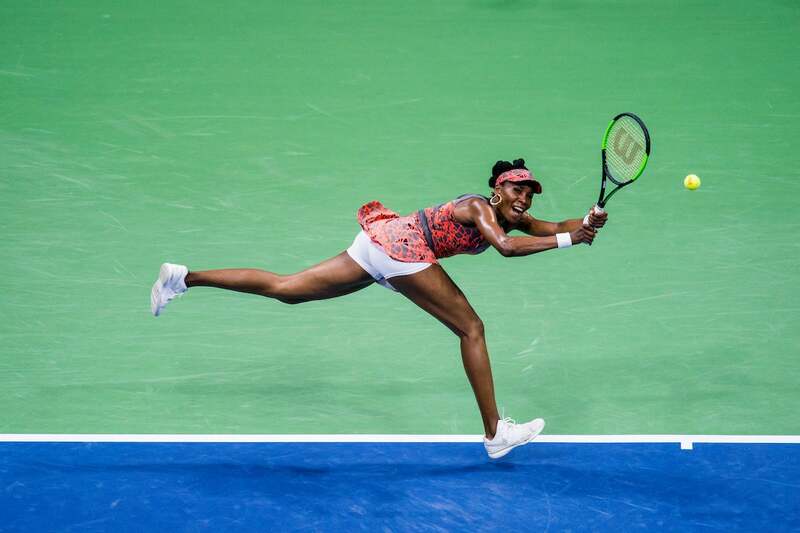 We spoke with professional photographer Darren Carroll, who had the opportunity to be court-side at the 2017 U.S. Open in New York. With his α9 and a unique collection of lenses, Carroll captured stunning images of the tournament. He was also able to position a remote camera in locations that only the silent α9 could gain access to. Alpha Universe: How did you get involved with shooting the U.S. Open? Darren Carroll: The U.S. Open is the only tennis event that I do all year. This would be my fifth U.S. Open. I've really enjoyed it. I've been going to it since I was a kid when I grew up in New York, and so about six or seven years ago, Sports Illustrated gave me the chance to go and shoot it once. 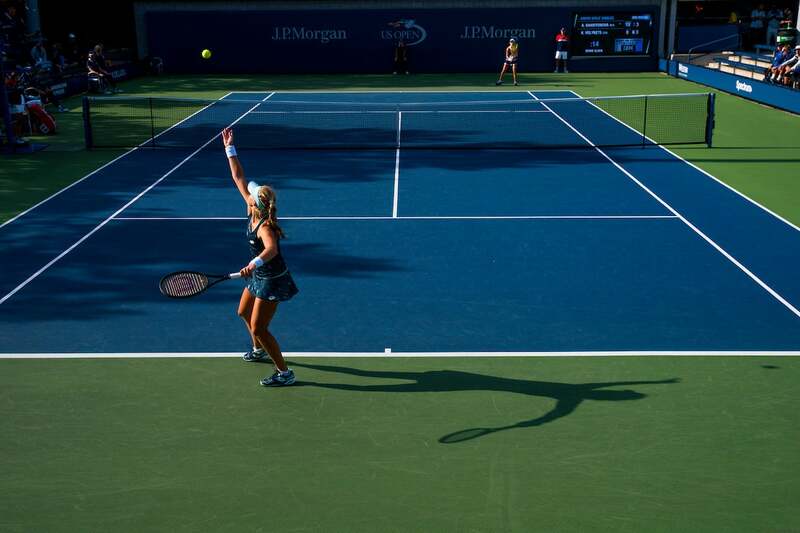 I went back another two times and was then given this opportunity to do it for the USTA and USOpen.org and I took it. I just thought it was a fantastic opportunity to be there for the whole two weeks, working with the amazing tournament team, and seeing a bunch of different matches and a bunch of different courts and just being able to really sink my teeth into it. 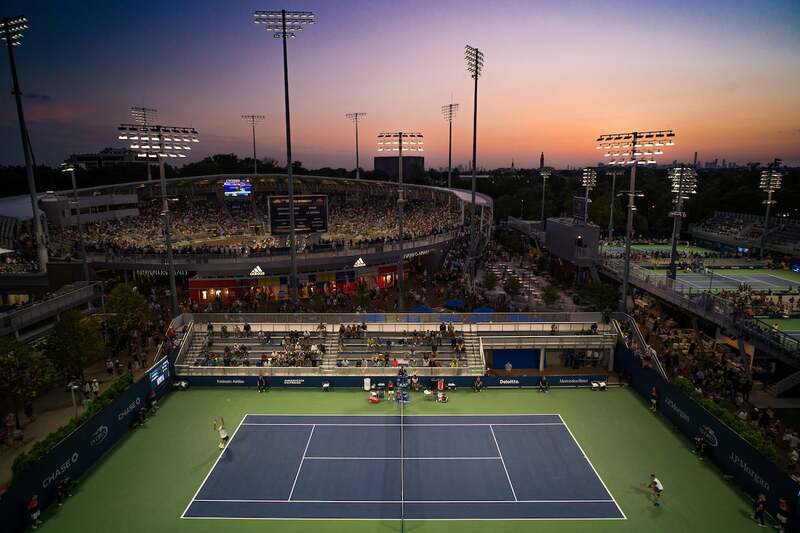 There's much more to the U.S. Open than just the action on the Arthur Ashe Stadium court. Sony α7R II. 21mm f/2.8 lens. Alpha Universe: How do you approach a two-week tournament when you're covering the entire thing and not just coming to shoot the finals? Darren Carroll: You keep trying to look for different things and different angles. 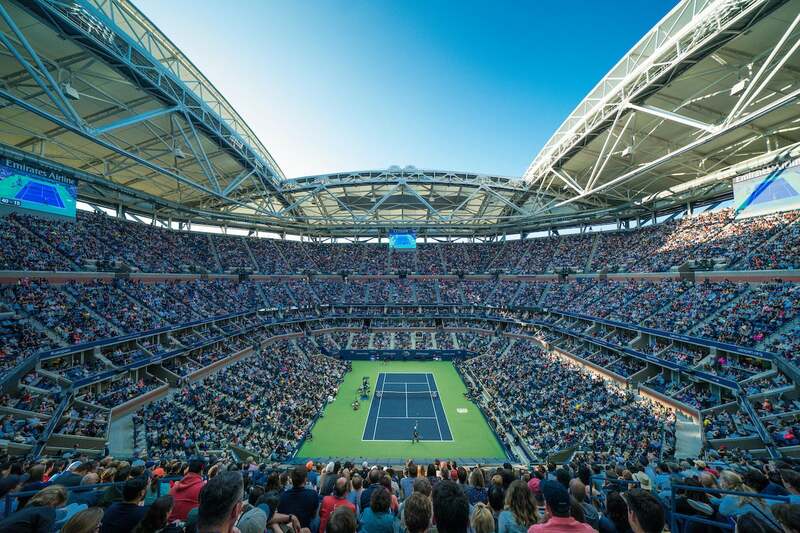 For example, every day now that they've put the roof on Arthur Ashe Stadium, the light has changed to the point where you need to be there if you're assigned to Ashe. You need to know exactly where you want to be for pretty much an hour, from about 1:30 – 2:30 p.m., because that's where you get a nice combination of light and shadow. Then just knowing where the later-afternoon light is going to be falling on the outside courts and which ones, at those times of day, also have the best shooting angles to take advantage of things like backlight and shadow. For example, I like the way Armstrong looks from this vantage point, or I like the way I can get up high on court 11 and shoot an overall when the sun is setting. You just sort of look for those opportunities and plan out the day. And of course, shooting with a team of people afforded me the luxury of being able to go out and explore and wait for a particular composition instead of putting all of the emphasis on immediate match coverage. Thinking beyond the point-to-point action, Darren Carroll takes advantage of stark lighting and the right background to make a stunning and intimate image. Sony α9. Sony 100-400mm f/4-5.6 G Master lens. Alpha Universe: What did you use to photograph this year's U.S. Open? Darren Carroll: I own the Sony α9. I bought it in June when it first came out and I absolutely love it. One of the things that I think makes the camera so good is its ability to use other lenses on it. To me, that is a huge selling point. Whether it's because I'm not in a financial position to replace the really expensive DSLR long lenses that I use, or whether it's because, for example, the Sony 400mm which is coming in 2018 isn't available quite yet, I’m drawn to the Sony mirrorless system because of its adaptability. I have all of these fantastic, older Leica M series lenses that I use with my α9 and they perform beautifully with the camera. Being on site to cover the entire U.S. Open gives Darren Carroll the chance to explore and look for a variety of images to tell the story of the 14-day tournament. Sony α9. Sony 12-24mm f/4 G lens. I was looking for a camera that would allow me to use those lenses, and when I put them on the α9, with the focus peaking and the live view in the electronic viewfinder - not on the screen, not on the back of the camera, but looking through the camera and having the ability to magnify the image and check focus – those lenses have been given brand new life. I can shoot them wide open and I know that what I'm shooting is going to be perfectly sharp. Alpha Universe: What are the lenses you used to shoot this U.S. Open? Darren Carroll: I used the Sony 12-24mm, the Sony 24-70mm G Master and the Sony 70-200mm G Master. I played around a little bit with the 100-400mm G Master, and the Sony team also let me borrow the A-mount 300mm and the 500mm lenses. I also used some of my Leica lenses with an adapter; my Leica 21mm, 35mm and 75mm. And I used some of my long-telephoto lenses like my 300mm, 400mm and 600mm. Taking advantage of the Sony α9's speed and dynamic range gave Darren Carroll the ability to capture dramaticly-lit action on the court. Sony α9. Sony 24-70mm f/2.8 G Master lens. Alpha Universe: That’s quite the list! 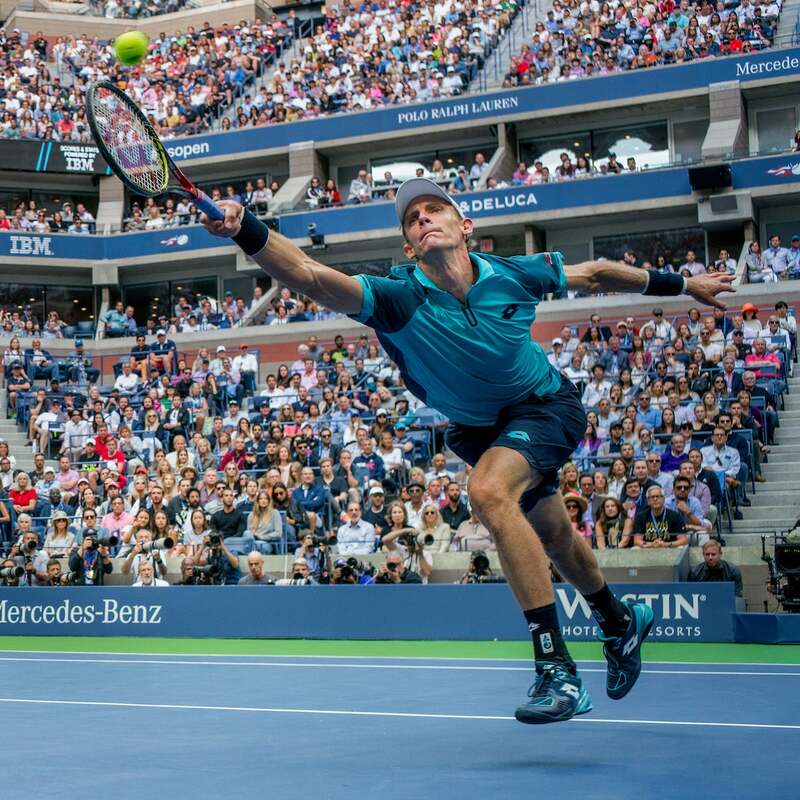 In addition to the α9’s adaptability with all of these lenses, what else made it your camera of choice to shoot the U.S. Open? Darren Carroll: Just the fact that it can shoot at very high speeds and has excellent auto focus. A tennis racket moves really fast. The player can open or close his or her eyes before, after or during their stroke at any time, so the more opportunities that I have to push that button and make a focused frame within that span of time, the better off I'm going to be. The action in tennis comes in furiously-fast bursts and Darren Carroll's α9 kept up. Sony α9. Sony 500mm f/4 G lens. You also can’t beat the dynamic range of this camera. The files that come out of this thing are absolutely gorgeous. I'm sold on it. The raw file as it comes out of the camera is so easy to work with. Just the detail that's in the shadows gives me plenty to work with on the backend. In tennis, you can get harsh shadows under visors, but with the raw file I can easily bring those out and make it look great. 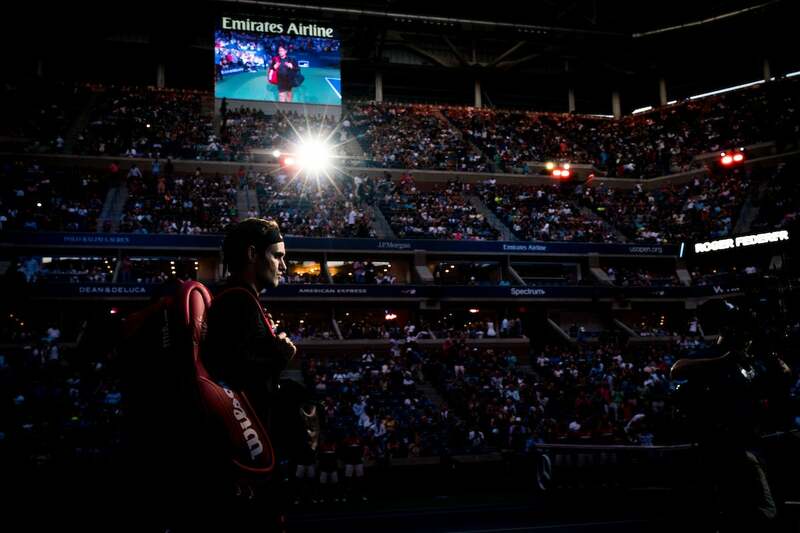 The silence of the camera was especially important for this [U.S. Open] assignment. One pertinent example of how I used the α9 at the U.S. Open, and where the on-site support of the Sony Imaging PRO Support team was so helpful, was when we got permission from the tournament to use specially-placed remote cameras. Catching the decisive moment and making a beautifully composed photo. Sony α9. Sony 24-70mm f/2.8 G Master lens. Alpha Universe: Were there particular images you were trying to get with the remote cameras? Darren Carroll: Yes. It was something that I had wanted to do for a while. The criteria for the remotes where I wanted to use them was the cameras had to be completely quiet. They couldn't make a sound. The α9 fit the bill perfectly! This was as much for the players as it was for television, because television has microphones near my remote locations that pick up all the ambient sound on the court. The remote cameras also had to have really tiny footprints and be pretty much unrecognizable. In order to achieve that, on one of them I wound up putting my 1970’s-era Leica Summilux lens on, which made the whole thing almost the size of a point and shoot and you could barely even tell that it was there. One of the things that actually got us to the point of being able to use the α9 this way was its adaptability. I simply couldn't do it with anything else. In addition to being completely quiet, I needed something that had a fast frame rate because I was going for low-percentage shots. For example, I wanted a particular shot at the net, so I had a remote α9 set up so if a right-handed player came to the net and was lunging for a forehand volley, we'd get that shot. A whole bunch of things needed to come together. Whenever you have remote cameras set up, there are always little glitches and gremlins that you learn slowly but surely. There's a learning curve, but with help from the Sony PRO Support team who lent us the α9 for that remote setup, we had the camera in place and working for the men's finals match, and it made the picture we were looking for. Sony α9 triggered remotely with a 1970's-era Leica Summilux lens attached via an adapter. For Darren Carroll, being able to use his considerable arsenal of vintage and unique lenses on the α9 via adapters is a huge benefit. 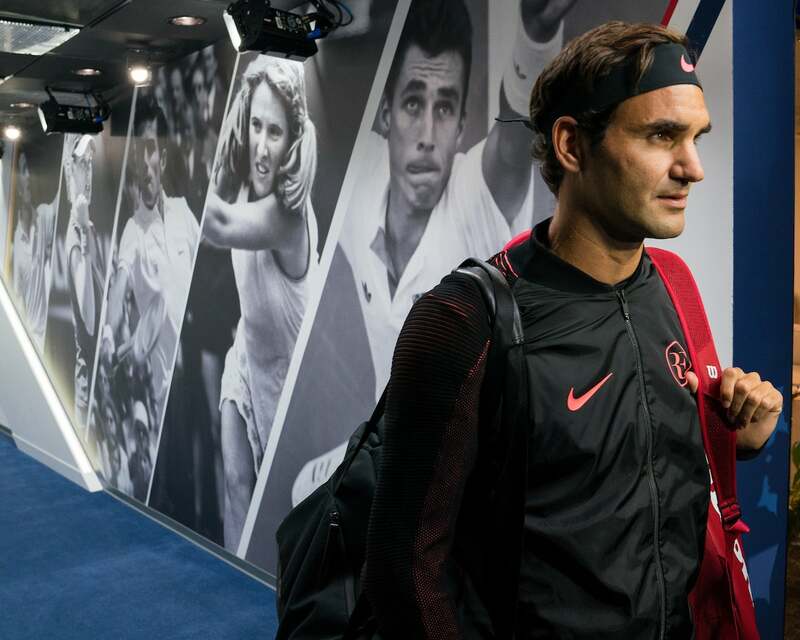 In the tunnel, prior to stepping onto the court. Sony α9. Sony 24-70mm f/2.8 G Master lens. 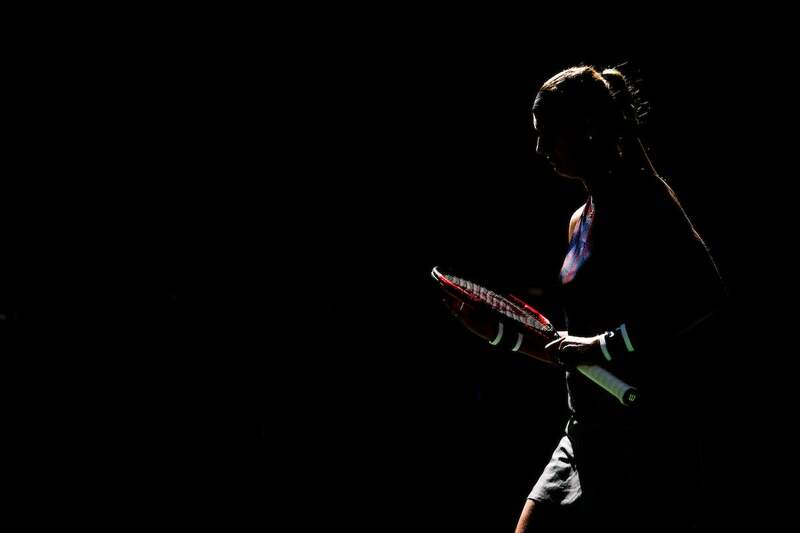 Among the challenges of photographing the U.S. Open is dealing with a variety of difficult lighting situations. The α9 performed beautifully for Darren Carroll. Sony α9. Sony 12-24mm f/4 G lens.